While the cordless tools tend to make most of the buzz around here with their capabilities expanding, corded tools are far from outliving their usefulness. We still get more power through a cord than we do from most cordless tools, plus the power supply is nearly unlimited. Here’s what we found to be exciting in the world of corded power tools for the 2014 Pro Tool Innovation Awards! What they say: Part of the CAMO Hidden Deck Fastening System, the Edge Pro is an auto-feed screw system that secures deck boards through the board edge. 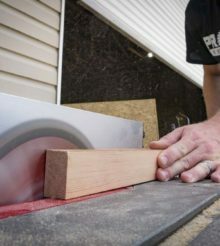 Most decks are currently built using the traditional face-fastening method, which encourages splitting, cracking, and fastener pops – annoyances that prevent homeowners from enjoying their outdoor living spaces. The Edge Pro eliminates these common problems by attaching the deck board through the edge, allowing the homeowner to enjoy a beautiful, fastener-free deck surface. What we say: You’ve got a couple of choices when it comes to hidden fasteners on decks: plugging systems and edge fastening. The CAMO Edge Pro sets up so there is no mistake in the angle that the screw is installed. Since there’s no additional step of plugging, this also saves time and money. The stand up design of the system will have your back and knees thanking you at the end of the day. What they say: The new Vecturo oscillating multitool from Festool combines versatile functionality and power with precision cutting to deliver the most advanced multitool on the market. Designed to provide the ultimate in controllability, the Vecturo is equipped with specialized, easy-to-mount accessories that make powering through the most challenging of tasks an ease, including a first-of-its-kind Plunge Base. This unique positioning aid allows users to achieve accurate, scribe line cuts anywhere in the material. The Plunge Base also incorporates a useful tilt action to allow access into difficult or awkward areas of work. The Depth Stop, which provides depth control for exacting plunge cuts, adds yet another dimension of precision to the Vecturo by ensuring the protection of both the saw blade and material. What we say: I never thought I’d be uttering the words “precision” and “plunge cut” in the description of an oscillating multi-tool. Festool has long been known for the high quality of their tools, and the Vecturo lives up to that. With the addition of the accessories, the Vecturo will be doing things well that no other multi-tool will be considered for. What they say: To achieve 2X more durability than the competition, our new Band Saws focus on a combination of external and internal developments. Externally, the Job Site Armor™ Technology is comprised of a proprietary composite material and crush zone barriers to absorb impacts. Internally, an all metal direct drive system provides maximum tool life and requires less servicing than the chain drive alternative. A gear protecting clutch extends gear and motor life by absorbing high impact forces caused by blade lock-ups, and the completely sealed design of the direct drive protects the internal gears from water and debris contamination over time. What we say: The Deep Cut Band Saw offers 5″ x 5″ cutting capacity along with increased cut visibility. Much of the innovation that Milwaukee packed into this is around its outstanding durability around the jobsite. The Crush Zone Barriers were designed to be replaceable rather than leaving you to deal with a damaged tool or having to replace it. What they say: SKILSAW SIDEWINDER uses our best in class Dual-Field™motor, which was invented specifically for saws. The motor‘s dual copper windings both power and cool the motor most efficiently to keep it running for a lifetime. Only SKILSAW has mastered this unique balance for optimal performance. Best-in-class torque improves the speed of cut increasing productivity and efficiency for the tool user.The 56°degree precision beveling capacity and true grip will make the SIDEWINDER the new jobsite standard circular saw. What we say: The all-magnesium construction of this saw lends itself to lighter weight while still maintaining strength. The fact that you get to use the saw for up to 180 days with a money back guarantee says a lot about the quality. We also love the fact that SKILSAW developed their motor specifically for saws and that the stock blade is from Diablo. What they say: The RIDGID 10″ Dual Bevel Miter Saw features a powerful 15 amp motor to power through the toughest materials. It bevels left and right up to 48° and extended 50° miter ranges. The sliding miter fences provide support for wider material and adjust for bevel cuts. What we say: Who doesn’t love lasers? The R4112 features a laser guide as well as bevel and miter stops at the most common crown molding angles. Throw in Ridgid’s Lifetime Service Agreement with the 15 amp motor and you get a compound miter saw that will be your favorite go-to saw on the jobsite. What they say: The DWE7499GD is the fourth model in DEWALT’s new line of jobsite table saws. The guard on the DWE7499GD table saw must be installed in its proper position for the unit to be turned on, or the user must activate an override switch to use the unit without the guard installed. When the guard is not in its proper position, an LED light flashes to warn the user of that condition. The rolling stand on the DWE7499GD allows it to be easily stored and transported on and off the jobsite, and the innovative fence design provides 32 ½” rip capacity that allows a variety of wide shelving and trim materials to be easily cut. What we say: Table Saw production went on hold while a court case deliberated safety features. DeWalt has come out with several new models including the DWE7499DG with their new Guard Detect, which forces the user to make a conscious choice when operating the saw without the guard. The rip fence is an outstanding example of useful innovation on this model. What they say: The RIDGID BEAST 10″ Wet Tile Saw is built to handle the largest tiles on commercial jobs. It can rip up to 34 inches and cut up to 24 inches on diagonal. It features a multi-position cutting head that easily moves left or right to provide maximum cut capacity and allows optimum material support through the cut. Its die cast aluminum table is rubber coated to provide solid non-slip material support. It also comes equipped with the WSUV Wet Saw Utility Vehicle to make transport and storage a breeze. What we say: 34-inch rip cuts and 24-inch diagonal cuts will get you through just about any tile you’d care to work with. The 3-3/4 inch maximum depth will ensure that you’re not likely to run into a cut you can’t make with the R4091. The work table expands to accommodate the larger tile capacity and the pump filter is brilliant. This is a truly beastly machine that you’ll love. What they say: The Milwaukee HAMMERVAC™ Dedicated Dust Extractor features an inline dedicated design engineered to connect directly to the new M18 FUEL Rotary Hammers. This design allows for a very compact HAMMERVAC™ and rotary hammer combination to fit in the most confined work spaces. Utilizing the same replaceable certified HEPA filter as other HAMMERVACS™, which filter 99.97% of all particles greater than 0.3µm, means more compatibility on the jobsite. For accurate hole depths, this product is built with an adjustable depth stop and ruler for easy and precise adjustments. Featuring a high capacity dust box, users can now work longer without emptying dust box as often. What we say: Many tool-mounted dust extraction systems require you to be attached to a hose. Still fully featured, yet compact, Milwaukee’s HammerVac system eliminates the hose and further expands the possibilities of their M18Fuel Rotary Hammers. What they say: The product system at the core of the new BuildClean business is a portable air scrubber/negative air machine designed specifically for the remodeling industry. This filtration system catches airborne dust before it can migrate from the worksite or hit the ground. A powerful fan draws air in from the surrounding environment, passes it through a series of filters and returns “scrubbed” air back into the space. When the exit air is vented outside a well-sealed work area, the unit is considered a negative air machine because the unit reduces the air pressure within the work area, preventing dust laden air from escaping. What we say: When someone says “dust extraction”, most people think of an over-sized vacuum with a large hose and lots of attachments to help clean up the shop. BuildClean’s Dust Control System constantly, and aggressively, pulls in the air around the entire work area to collect the dust that would normally be able to spread around the home or office.